You might not be familiar with your IT (or illiotibial) band - the thick cord of connective tissue that runs down the outside of your thighs from your hip to your knee. Your IT band does an important job of stabilising the hips and knees, especially during high-impact exercises like running or jumping. And if it gets tight and irritated, you'll know it very quickly. That tightness can lead IT band syndrome (ITBS), a condition when you might feel pain along the outside of your thighs, your hips, or your knees. In fact, if you've ever experienced knee pain, there's a chance it's a tight IT band - and not an issue with your knee itself. You'll often feel aches during lateral movements or when you're putting more weight on the affected leg, during running, or other high-impact activities. For that reason, ITBS is common among runners, cyclists, and people who walk for long distances. To ease the aches, people often do stretches, where they lean side to side to get the band to loosen. But it turns out, these common stretches don’t do much at all. “Studies of the structure of the IT band suggests that it's highly unlikely it can be stretched because it’s too strong,” says running coach Jeff Gaudette. Along the same lines, foam rolling the area won’t offer much relief either, he adds. To target the right muscles that will help fix your mobility and movement patterns, and relieve your IT band pain, give these stretches a go. Hold each one for at least 10 seconds. This stretch helps release tension in the glutes, which can lead to IT band issues. On an exercise mat, lie face up with your knees bent and feet flat. Raise left foot to the ceiling and hold the grasp just below the knee to hold it up. Then, pull the foot toward your chest, turning the shin to the side so it’s almost perpendicular to your body. Hold the stretch, then repeat on opposite leg. For a deeper stretch, keep non-stretching leg extended on the floor as you stretch. If your IT band is being overused, it's normal to feel pain in the outer thighs, since it's what connects them to your knees and glutes. 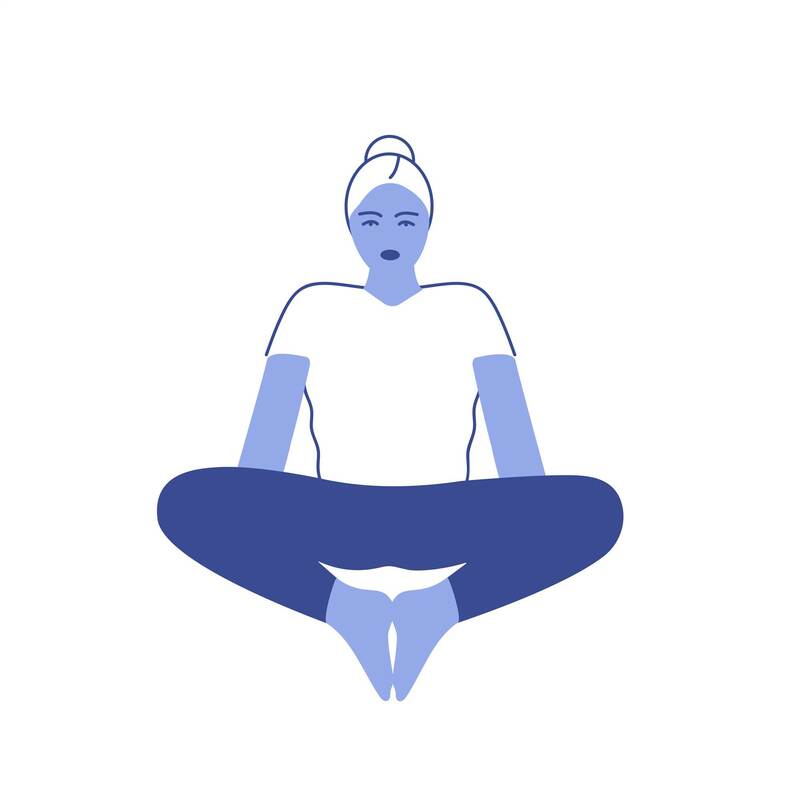 Sit on an exercise mat with your knees bent and the soles of your feet pressed together on the floor in front of you. Place your hands on the floor behind you for balance. 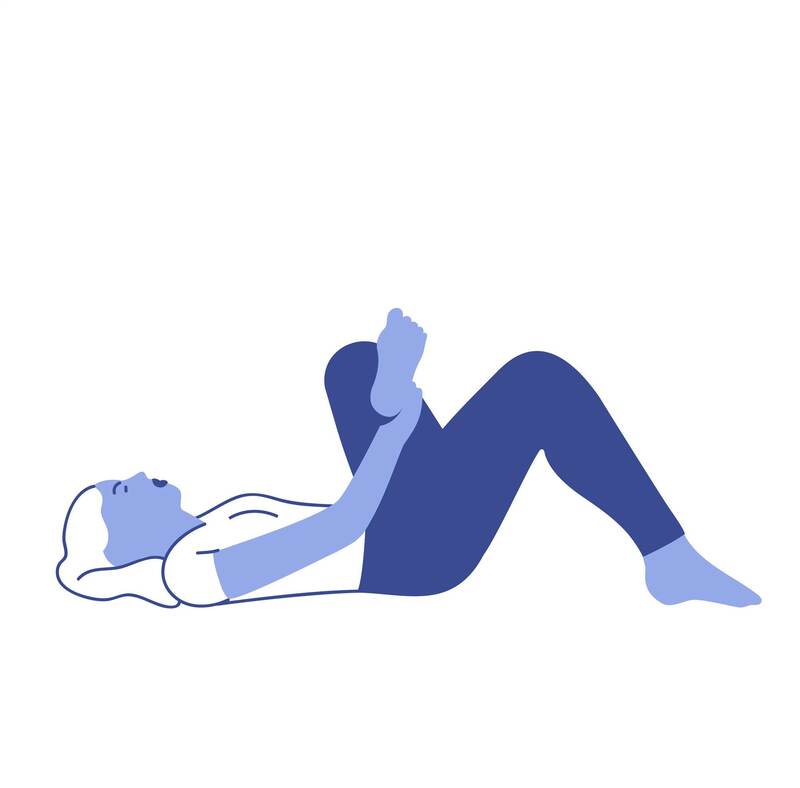 Sit up straight, tilting your pelvis forward and leaning into the hands, as you let the legs sink toward the floor, then relax and let knees come up slightly. Lie faceup on an exercise mat with a yoga strap or resistance band wrapped outside your left ankle. 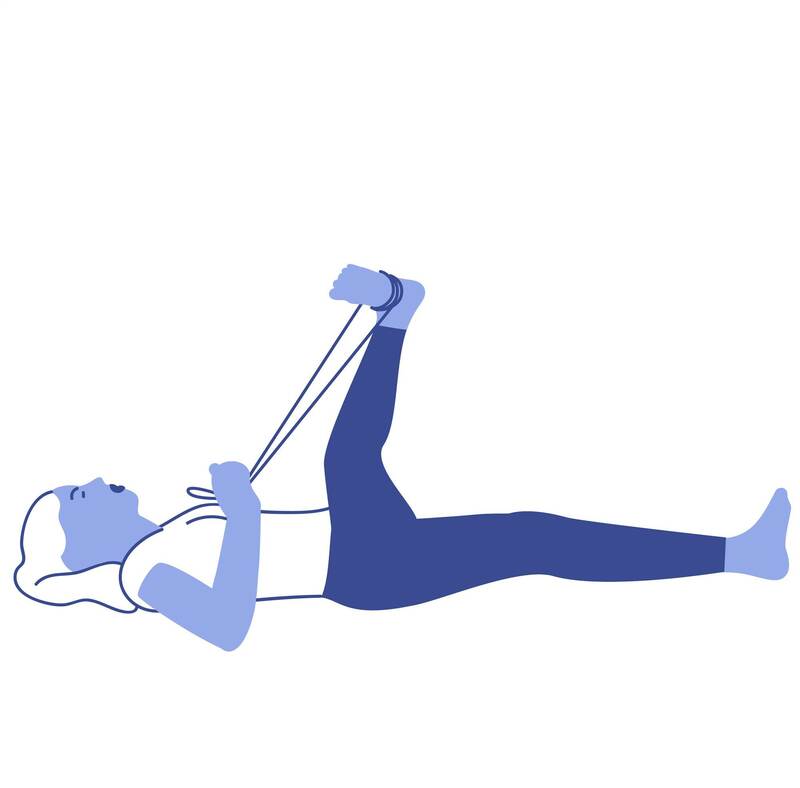 Holding both ends of the band in your right hand, pull up to raise your left leg so the foot is pointing toward ceiling. Keeping leg straight, pull the band to the right to extend your left leg across your body, keeping the left hip on floor. Hold, then repeat on opposite side. Lie on your left side, curling body into fetal position with legs stacked directly over each other. Hold left leg at shin with left hand and right ankle with right hand. Keeping body in tucked position, pull right leg behind you. (The tucked position helps isolate your quads.) Hold, then repeat on opposite side. Kneel in front of a wall, facing away from it. 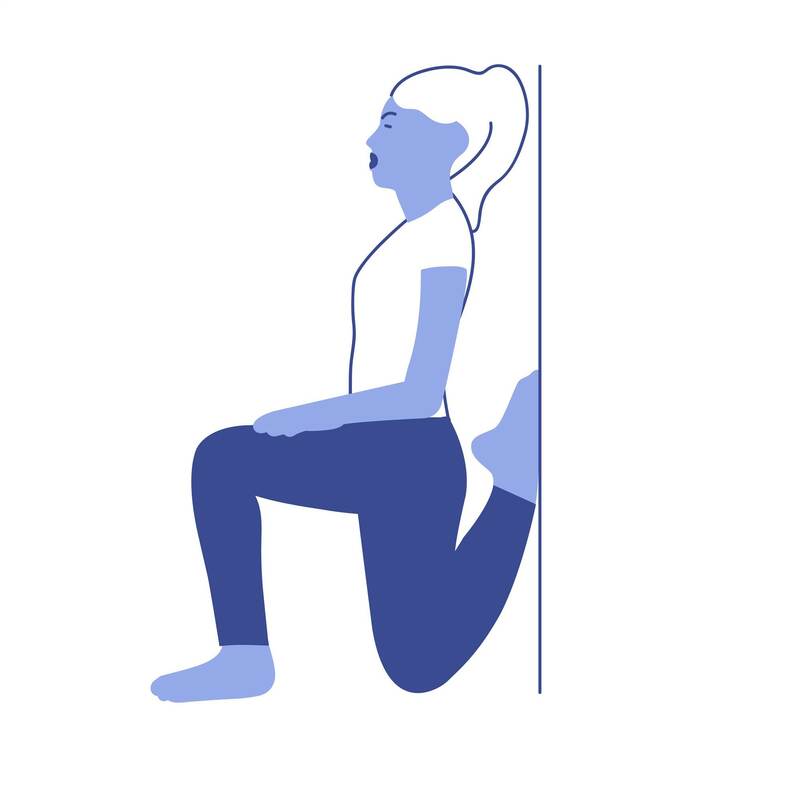 Keeping your left knee on floor, raise your left foot behind you and let rest it against the wall. Step your right leg out with the foot flat on the floor and the knee bent, thigh parallel to floor. Hold, then repeat on opposite side. Stand to the right of a bench. Keeping your right foot on floor, rest left knee on the bench. Lift your left foot behind you and wrap a long yoga strap or resistance band around it. Bend the right knee and lean forward until you feel the stretch in your left quads and hip flexors. Hold for 30 seconds, then repeat on opposite side. If you don't have access to a bench, you can also do this stretch on the floor. Sit on floor with your knees bent and feet flat on floor. 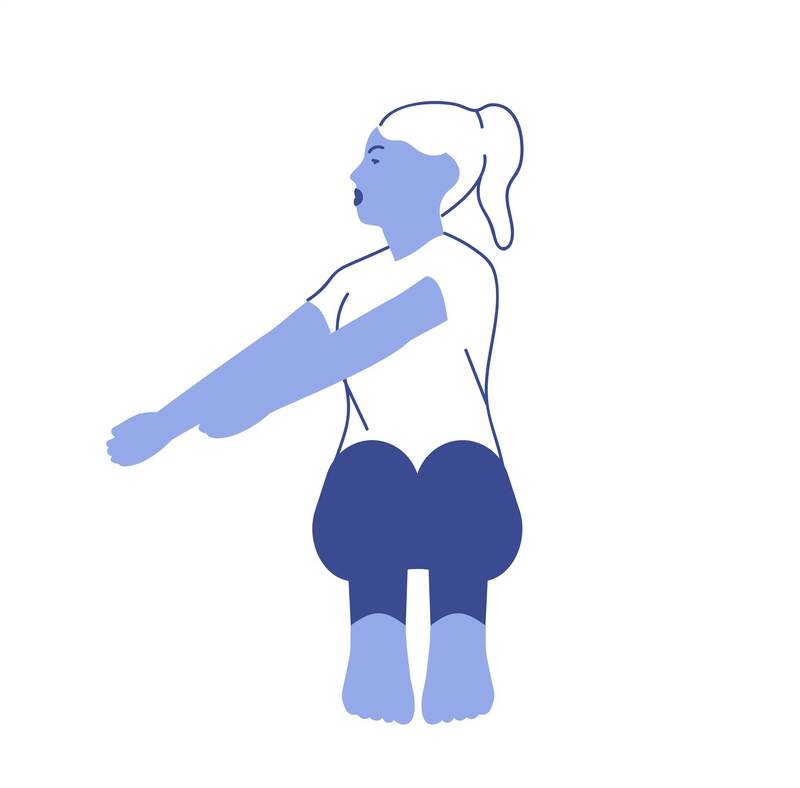 Twist your torso to the right, pressing against the outside of your left knee with your left arm and looking behind you. Hold, then repeat on opposite side.